Hormonal imbalance is the main cause why women experience so many unpleasant side effects throughout the onset of menopause, and sometimes even before and after. To alleviate women’s suffering, Gaia Herbs Women’s Balance was created as a natural supplement, ideal for reducing the intensity and occurrence of these episodes. If you want to learn more about this product, you only need to read further. 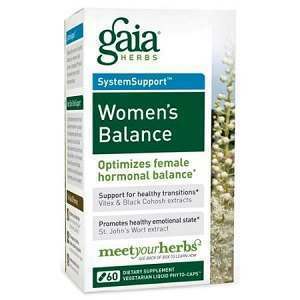 What Does Gaia Herbs Women’s Balance Contain? Black cohosh is a well known treatment for women going through menopause, and it has been used traditionally for a long time. The amount of herbal nutrients in this product is quite satisfactory and it is important to know that the manufacturer came up with a proprietary blend by researching these herbs thoroughly. The recommended daily dosage is three pills taken between meals. The listing price for a bottle with 60 capsules, or 20 servings, is 28.99USD. The only guarantee offered is for 30 days and only for unopened products. Gaia Herbs Women’s Balance seems to be a reliable, well rounded product, with many herbal extracts being included in the formula. However, we didn’t like so much that no actual refund is offered if the customer is unhappy with the results, since only unopened products can be returned for a full refund. Jackie Horowitz	reviewed Gaia Herbs	on August 8th	 and gave it a rating of 2.